ROFFS™ will again be exhibiting at the 2019 Progressive Insurance Miami International Boat Show, from Thursday, February 14th, through Monday, February 18th, 2019 at the Miami Marine Stadium Park & Basin, Virginia Key, FL. 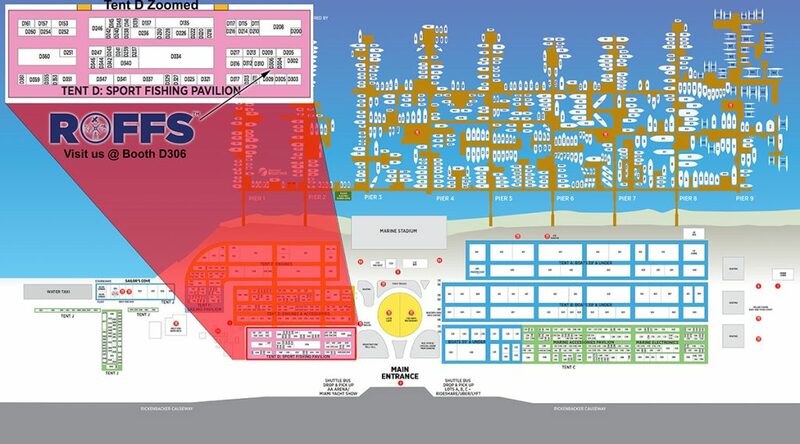 ROFFS™ will be located in the Sport Fishing Tent (Booth D306) – see map below. Stop by the ROFFS™ booth and chat with owner Matt Upton, and three of our expert fisheries oceanographers Greg Gawlikowski (Thursday-Monday), Dan Westhaver (Saturday) and James King (Sunday-Monday). Come by to see our newly redesigned booth and marketing materials and find out about our 2019 discounted fishing plans & packages (click here). Come visit us on Thursday from 1-2PM when we will have Capt. Ray Rosher from Miss Britt Charters a long time ROFFS™ client along with Craig Myers from mazu Sportfishing to talk about our new partnership with mazu. We will also have representatives from mazu in the booth Friday and Saturday afternoon to demonstrate how our ROFFS™ analyses integrate with their mazu sportfishing app. Also, come to see what great marketing opportunities ROFFS™ provides advertisers to our very exclusive audience. Show hours 10 AM – 6PM Thursday – Monday. Can’t make the show? Call the office for our special pre-season discount prices. Please remember that the deadline for Pre-Season Discounts is March 15, 2019. You should have received a mailing with our newly redesigned post cards before the boat show. Please contact the office (321) 723-5759 or fish7@roffs.com with any questions about the show. We know that you realize that every fishing trip is important. Now is the time to start your fishing season – the correct way – with ROFFS™!